The highlight of yesterday’s racing at Marsa was the President’s Cup final for Premier Class trotters which was contested on a short distance of 2,140m. The prestigious event formed part of the 39th meeting of the season that was made up of nine races, all trotting. Eleven horses contested the final as the President’s Cup was won by French horse Pedro Vici, driven by one of its owners Johan Axisa. One of the championship’s semi-final winners, Mad Image, was scratched a few hours before the start. Pedro Vici stormed ahead in the initial stages, opening a four-length lead from Original Blue (Chris Cassar) and Vejby Boom (Charles Camilleri). Pedro Vici went almost unchallenged for most of the distance and led all the way to a remarkable victory, its third on the trot. At the post, second-placed Original Blue was six lengths behind the winner as Vejby Boom and last year’s President’s Cup winner, Gently Di Poggio (Brian Hili), followed in that order. At the end of the race, Malta President Marie Louise Coleiro Preca distributed trophies to the owners and driver of the winning horse. This final was a race to forget for two of the big favourites, Pat De Fontaine and Ohime Mag. Both changed pace after only a few metres and got disqualified by the stewards. Pedro Vici clocked an excellent average time of 1.14.4” per kilo-metre. The other eight races in programme were all heats from championships open to French trotters – the Prix d’Enghien for Gold Class trotters, Prix De Cabourg for Silver and Prix De Cagnes Sur Mer for Bronze. Gold Class race favourite Qurieux Du Ponchet (Noel Baldacchino) upped its pace with a lap to go before securing its third successive win at the racetrack ahead of Quintet (Wayne Farrugia) and Pan Des Couperies (Charles Camilleri). Nitesco D’Antony (David Ellul) and Pepone Du Castelet (Cliferty Calleja) also made it to the next stage of the championship. Milord Barbes (Redent Magro) held off the challenge from Nagano Phedo (Mario Fenech) in the final straight of the other Gold race on the card. Milord Barbes recorded its second win of the year with Pepito Flash (Clint Vassallo), Quartz Nay (Anthony Camilleri) and Panda Des Fleches (Chris Cassar) also obtaining a good placing. 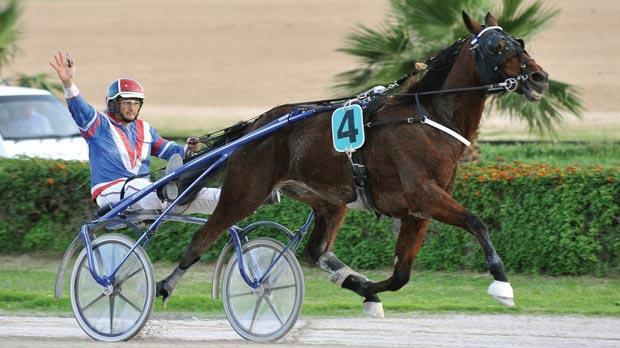 Another meeting at the Marsa Racetrack will be held next Sunday afternoon.